We love learning how a master is inspired. Especially in fashion. Born in Granville, Normandy, master couturier Christian Dior grew up in the kind of lush rural environment favored by the Impressionist artists who drew such inspiration from nature. Throughout his career, Dior designed dresses that evoked, to the discerning eye, the ravishing light, color, and movement that these revered artists depicted so superbly. And, it is so richly seen in the September release of Dior Impressions The Inspiration and Influence of Impressionism at the House of Dior by Florence Müller with texts by Philippe Thiebaut, Farid Chenoune,Barbara Jeauffroy-Mairet, and Brigitte Richart from the chicest book publisher, Rizzoli Books. 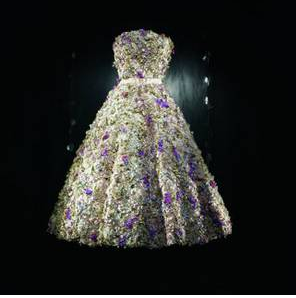 Published to accompany the Impressions Dior exhibition presented at the Musée Christian Dior in Granville, France, the book features over 150 images of art by such luminaries as Monet, Renoir, Degas, and Manet, complemented by a range of garments from Christian Dior’s first designs, to Raf Simons’s latest collection. The book essentially connects the arts of painting and fashion, in a book that anyone with an interest in either will want for their library. We really love that. We love that authors are so attuned to their subject. Florence Müller is an art and fashion historian, and curator of numerous important exhibitions. She is professor at the Institut Français de la Mode and Philippe Thiébaut is the curator of the Musée d’Orsay. Farid Chenoune is a fashion historian and professor at the École Nationale Supérieure des Arts Décoratifs.